that hopes to bring adult prestige to the vampire subject that has been dominated more recently by teen-targeted fare. Mike Leandro with Payam Films discovered the Matt Deller-written script through InkTip. Directing the film is Babak Payami, an Iran-born filmmaker who won awards at the Venice Film Festival for "Secret Ballot." 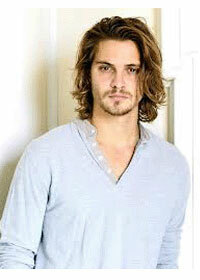 and Luke Grimes of "True Blood" and "Taken 2," though he is now best known as being cast in the role of Elliot Grey in the upcoming film adaptation of "Fifty Shades of Grey." The story is described as centering on a vampire who "seeks out an artist to paint her a portrait so that she can see her image for the first time, unaware that the artist is dying and working to create his last masterpiece that will give him artistic immortality." If this vampire seduces not only a painter but a large audience, then artistic immortality will be a few strokes away for the artists involved in "Manhattan Undying."